is NOT Earning More Money or Buying More “Stuff”! It’s having FUN Together, Achieving Meaningful Goals. Read on to find the BEST place in Slatington to do it!! It’s a constant battle to raise a family these days. Everyone is running off in different directions, and even if you can corral the whole family into the same room at the same time, they’ll probably be staring like zombies at their cell phones or tablets, instead communicating with each other. As parents, it’s painful to watch helplessly as your precious children drift away, and the farther they drift, the harder it becomes to communicate and to trust each other. It’s only a matter of time before their friends’ approval is more important than your approval. What can a modern parent do? and I’m very PROUD that HUNDREDS if families in the Slatington area are sharing their “best kept secret” with all their friends: That our Family Karate program in is the answer they have been desperately seeking. If you’d like to bring your family back together, or prevent it from drifting apart in the first place, I’d like to show you how martial arts families achieve unity and happiness. Best of all, you can try it out . . . with NO RISK! Complete the form on this page to take advantage of our WEBSITE ONLY “No Strings Attached” Special Trial Offer, and you’ll immediately understand how shared goals and shared activities have a positive, uniting influence. 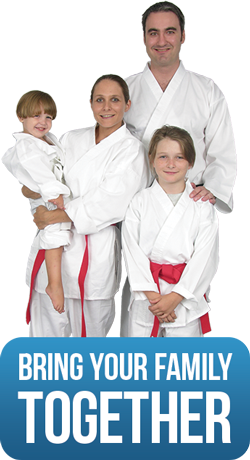 Our innovative martial arts program is fun for the whole family! In our Slatington Innovative Karate Program for Families, everyone participates: children, parents, and even grandparents can attend classes and progress at their own pace. In our action-packed family classes, no one sits on the bench! Children practice with other children, and adults practice with other adults. Martial arts classes are one of the only family programs where children and their parents get the same kind of healthy exercise at the same time. 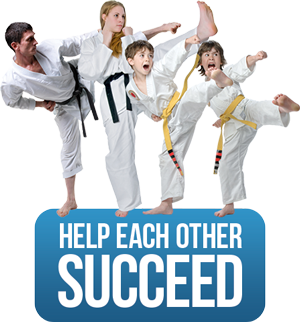 Because everyone must master the same impressive skills, families at Emerald Dragon Karate have shared goals. Family members will practice their martial arts skills together before and after class, and even practice at home to help each other succeed. Discussions in the car or at the dinner table will center around the family’s new common interest: The valuable life lessons being taught in class about character development and leadership. Each member will have their own insights, their own frustrations, and their own triumphs, but they will feel comfortable sharing them because they know the other members of the family have the same interests and experiences. Of course, children may be more naturally flexible and adults may be stronger, but everyone progresses according to their own talents and abilities. Elite athletes perform at a higher level than soccer moms, but each can acquire their skills at their appropriate level. Feeling too old or out of shape? No problem! Our innovative Karate program is the best way to get back in shape. Worried you might feel awkward? No worries. We teach everything step-by-step in our beginner’s classes in a safe, controlled environment. Hesitant because your child quits everything? You’ll be there every step of the way learning the same exciting skills to provide the motivation he or she needs. Plus, our belt system helps your child set goals and get the powerful positive reinforcement of achieving those goals. Your child will become more focused at school, more respectful to you and to the teachers, better behaved, and more confident when dealing with others. The nicest part is that each member learns to RESPECT the other member’s strengths and efforts, and SUPPORT the other member’s weaknesses. They help each other when things get tough, and they celebrate each other’s victories. Well, I have great news for you: You don’t have to Imagine! You can feel it all for yourself at NO RISK and NO OBLIGATION! “No Strings Attached” Special Trial Offer that is only available on this website! Emerald Dragon Karate is the best place in Slatington for families to have fun and achieve meaningful goals. P.S. : Don’t forget that we specialize in self-defense! You can’t be there all the time to protect your family, so give them the tools they need to protect themselves.